Think No Further… Get Your Magic Today!! Advanced hair fibres instantly rebuild your hair with natural keratin fibres creating the appearance of thicker hair in an instant! The Thickening Fibres blend in and electro statically bond with your existing hair, dramatically building up hair volume and minimizing the appearance of thinning hair. As you apply The Thickening Fibres to your scalp you will see balding patch and thinning hair simply disappear. Once you have completed applying the Thickening Fibre you simply brush through your hair and the fibre blends with your existing hair in a completely undetectable manner. 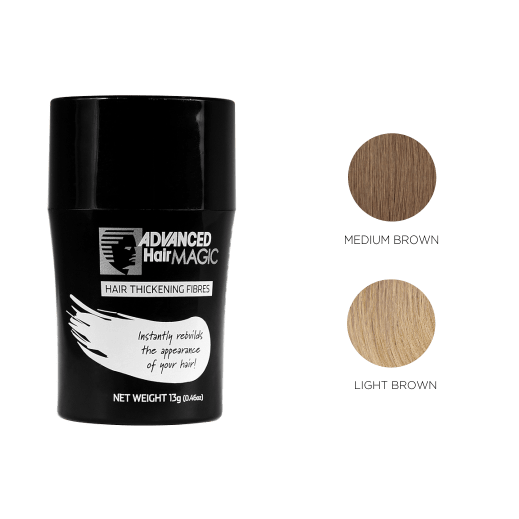 Advance hair fibre is a unique complex of organic keratin protein similar to your own naturally growing hair. They are precision laser-cut into micro-sized-fibres and are a completely safe and natural solution for both men and women. No matter what the weather conditions are be it strong winds or even rain, the micro composition of The Thickening Fibres ensures they stay bonded to your existing hair. When you do wish to remove them simply wash them out with shampoo. Anyone suffering from balding or thinning hair, or wants a thicker looking hair, can instantly alter their appearance with Thickening Fibres.